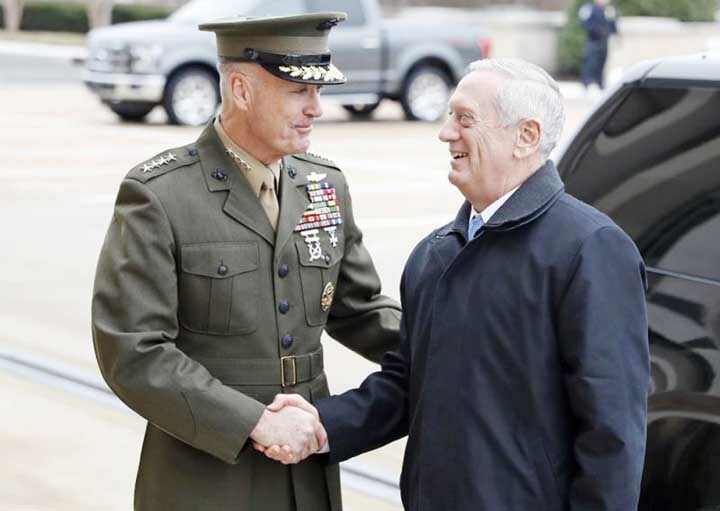 Joint Chiefs Chairman Gen. Joseph Dunford greets Defense Secretary James Mattis at the Pentagon. US Secretary of Defense James Mattis reassured NATO allies that Washington had an "unshakeable commitment" to the military alliance, despite President Donald Trump previously deriding the organization as "obsolete." On his first full day in office Mattis spoke by phone with NATO Secretary General Jens Stoltenberg and his British and Canadian counterparts. Mattis "emphasized the United States' unshakeable commitment to NATO" in his call with British Defence Secretary Michael Fallon, Pentagon spokesman Jeff Davis said in a statement. Mattis "emphasized the United States and the United Kingdom will always enjoy a uniquely close relationship, reflected in our defense ties which are a bedrock of US security." British Prime Minister Theresa May will visit Washington on Friday, the first foreign leader to meet with Trump since he took office. In his call with Stoltenberg, Mattis-who had previously served in a senior NATO post-discussed "the key role NATO plays in transatlantic security." Mattis "wanted to place the call on his first full day in office to reinforce the importance he places on the alliance," the statement read. "The two leaders discussed the importance of our shared values," and Mattis "emphasized that when looking for allies to help defend these values, the United States always starts with Europe." Stoltenberg later said from Brussels that he had "an excellent discussion" with Mattis, and described him as "a strong friend of NATO at the Pentagon." Mattis also called Canadian Defence Minister Harjit Sajjan, and the two men "reiterated the depth and breadth" of the US-Canada relationship as partners in the North American Aerospace Defense Command (NORAD), "NATO allies, and North American neighbors." The two military leaders also "addressed the importance of North American defense relations among the United States, Canada, and Mexico," the statement read. Ahead of his inauguration, Trump told two European newspapers he had long considered that the North Atlantic Treaty Organization had "problems." "Number one, it was obsolete, because it was designed many, many years ago," he said, referring to its Cold War, post-World War II origins. Trump said in his inaugural address Friday that the United States had "subsidized the armies of other countries," highlighting a common cause of friction in the 28-nation alliance. In response to Trump's remarks, German Chancellor Angela Merkel warned that Europe had to take responsibility for itself.